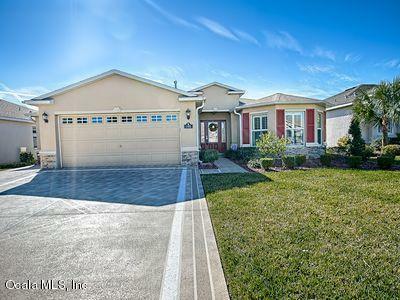 BACK ON MARKET - MOVE IN READY- GOLF COURSE FRONTAGE This 3 Bedroom 2.5 Baths OPEN FLOOR PLAN - POPULAR MONTEVERDE II MODEL modified from original builders plan with additional room in breakfast nook. Additional GOLF CART Garage. Plantation Shutters, Stainless Steel Appliances, Granite Counters are just a few of the upgrades you will find in this prestigious home. Additional 1/2 bath is conveniently located as you come in the garage for quick clean up after a day of golf. Lanai has southern exposure for comfortable afternoon leisure. Summerglen offers the privacy and peace of mind of a gated community located in a beautiful country setting. Community owned facilities. LOW HOA includes mowing/edging, garbage/recycle services and a $20 mo food voucher to on-site restaurant & Bar.